I arrived at the Collegio San Giuseppe with mixed feelings of excitement and trepidation. 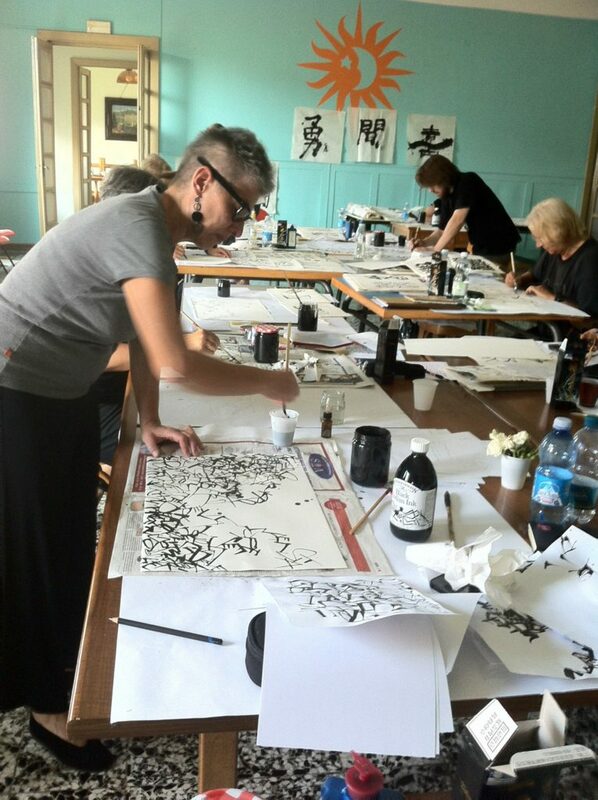 A whole week devoted to exploring Japanese and Western calligraphy? And yet I had so little practical experience! 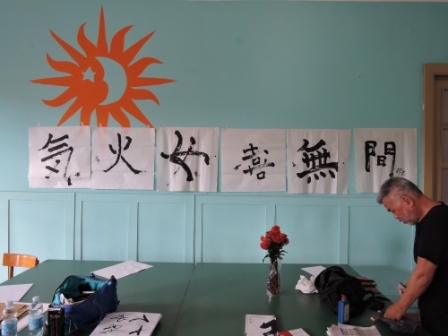 My ostensible reason for coming was academic: to deepen an understanding of a famous text on Japanese aesthetics – In Praise of Shadows by Junichiro Tanizaki – that is central to my High School teaching syllabus for the International Baccalaureate. Would I be able to sustain such a concentrated spell of hands-on learning? 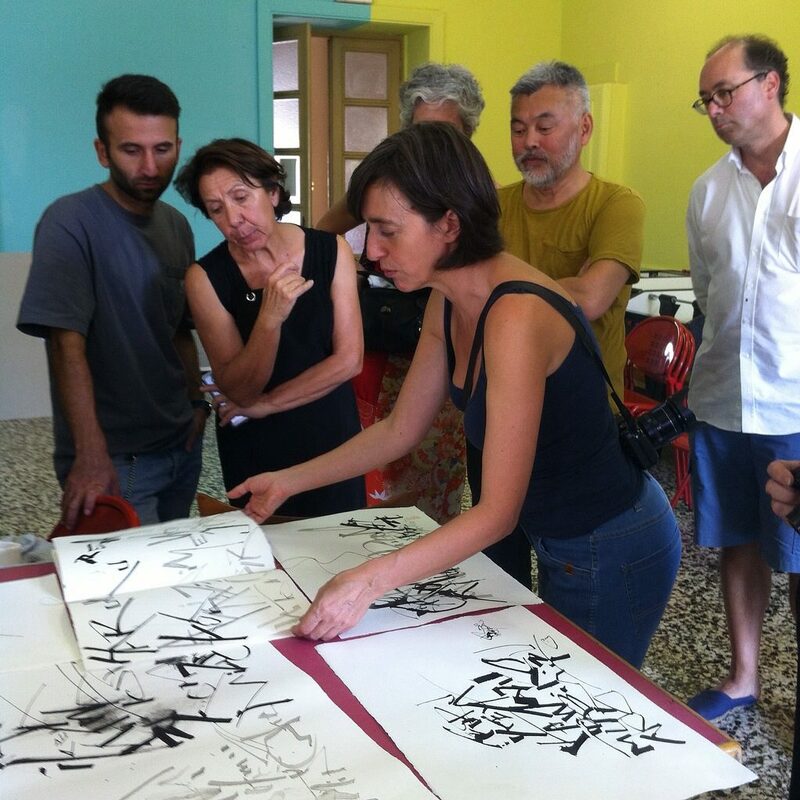 Any fears were quickly allayed as I met the other participants, the tutors – Monica Dengo and Norio Nagayama – and Patricia Parpajola the course director. Everyone was so open and friendly. It was clearly going to be a most enjoyable week. 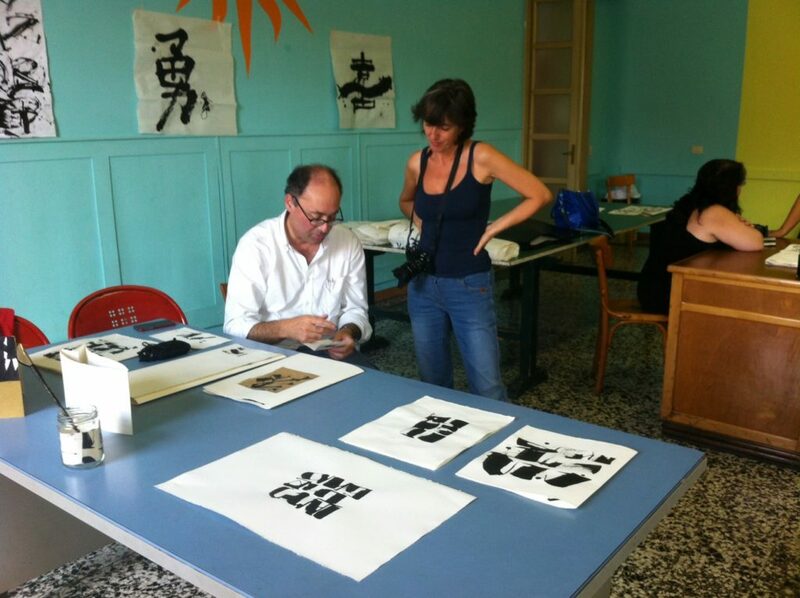 Day one and the expertise displayed by Monica and Norio was immediately inspiring. A teacher myself, I was struck by the generosity of spirit with which they not only gave advice and criticism but also actively demonstrated in their own work. Considerable risk is entailed in such ‘live’ performance and it embodied the sense of trust that underlies these courses. For me this was precious. 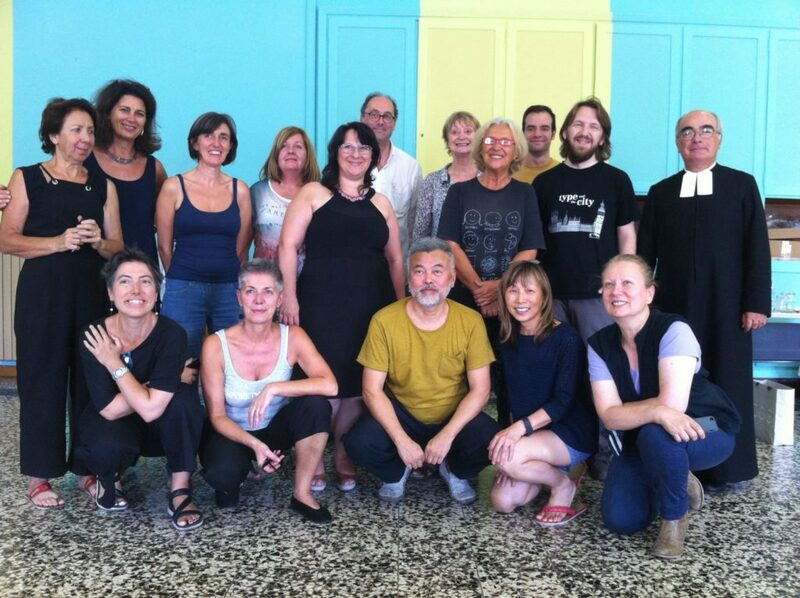 Such generosity extended beyond the official sessions and to the many coffees, glasses of wine and meals during which it was possible to talk and not only about calligraphy but wider issues to do with art, poetry, cinema. 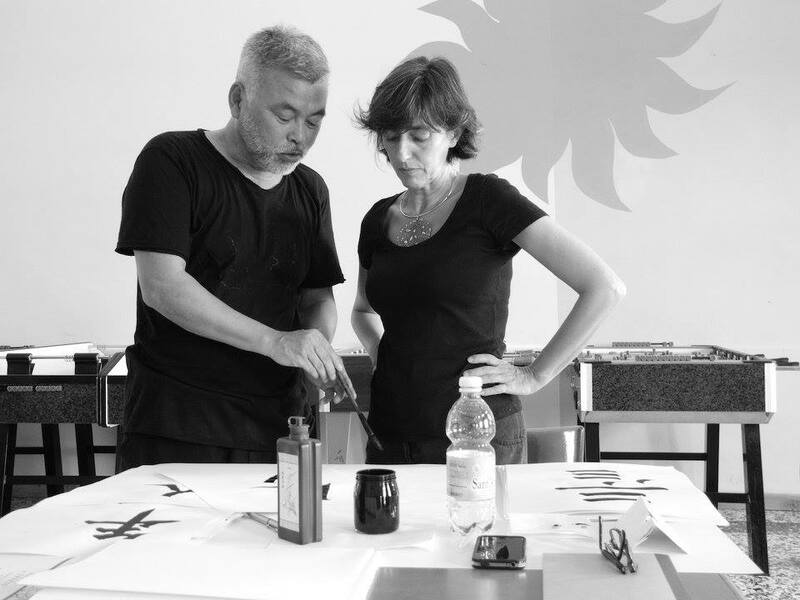 It became apparent that for both Monica and Norio calligraphy is inseparable from a deep commitment to entering into dialogue between cultures and a practice of self awareness – a way of living and being alive. In keeping with this philosophy, the week was punctuated with visits to the Oriental Museum to see Monica and Norio’s joint exhibition as well as the Egyptian Museum. Patricia was ever helpful with recommendations of cafes or restaurants for a lunchtime or evening. As one of the participants said on the last day, the course had exceeded even her highest expectations – a sentiment shared by all. Looking over the pieces we had each assembled during the seven days it seemed hard to believe the quality and sheer variety of work. This, in itself, is a testament to the encouragement given by the tutors to explore possibilities and find one’s own authentic form of expression. In his collection of travel memoirs Italian Hours, the American novelist Henry James wrote of the charm he found “in the tone and the air and the happy hazard of things”. While he was describing his impressions of Italy as a whole, I can find no better way to capture what I have so profoundly appreciated about my week in Turin.